Navigates through risky waters without making waves. »We wanted software that met our own high standards and are sure that you are also not prepared to settle for less. All too often, we ourselves had to look for ways to adapt our business processes to a given system. We wanted a software that adapted to our processes – not vice versa. And one that worked for all asset classes. Aquantec Ocean gives you true cross-asset capability over the entire range of its functions leveraging its generic data model – comprehensively and seamlessly, integrated instead of parallel. We enable aggregated risk views and complex simulations across all asset classes. 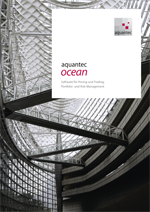 The models and algorithms Aquantec Ocean uses make the software reliable and facilitate transparent evaluation. That means security, clarity, and precision for you and your business. The powerful simulation capabilities of Aquantec Ocean – in combination with the determination of market and book values – allow you to optimize your investment strategies and to satisfy recent regulatory requirements. Our scalable architecture and technology are free of the baggage of older systems. Resilience and transparency are ensured by the sophisticated interaction of all system components. Modular structure and agile development make sure that you get exactly what you need.